Legendary Singer Songwriter and Activist co-writes "Together" for Animated Film Set for Release January 25th. 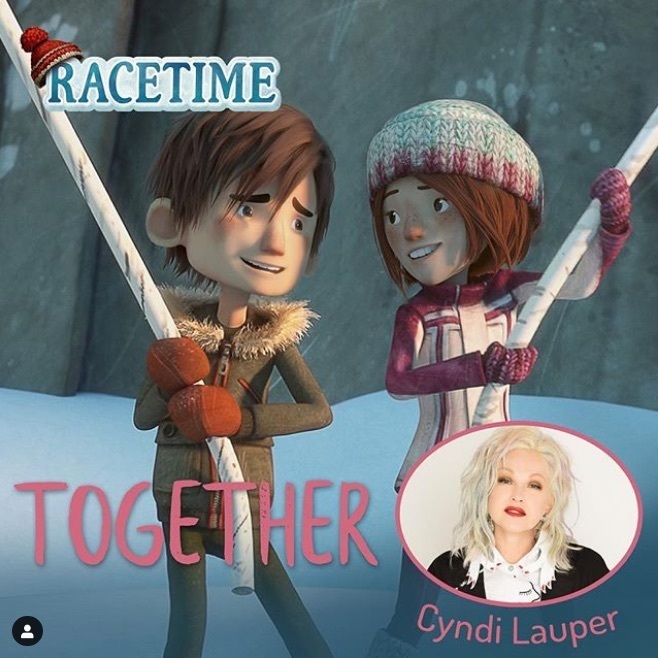 Montreal, QC - Legendary artist Cyndi Lauper has contributed an original song to the Soundtrack for Racetime, the sequel to the award-winning animated film Snowtime. The song, co-written by Montreal artist and songwriter Dumas, will be released as a single on January 17th, and will be available on iTunes as well on all digital platforms (https://Musicor.lnk.to/RacetimeEM). Snowtime was the recipient of the coveted Gemini Golden Ticket Award for highest grossing Canadian film of 2015. The sequel will be distributed by Entertainment One and will open on over 70 screens across Canada. The film was produced by Canadian production company Carpediem Film and TV. Lauper and Dumas’ contribution to the Racetime Soundtrack is a song called "Together" an upbeat anthemic track about sticking it out through thick and thin. It is part of a nine song soundtrack of songs that feature positive messaging for kids, produced by Bludog Media. The Racetime OST will be available digitally on January 25 on all digital platforms.